Chewy Dense Brownies: As the name suggests, these brownies are both chewy and dense. They’re also fudgy, delicious, and so incredibly simple to make! No box mix needed here! When I picked up The Perfect Scoop last year, I read through the Introduction and The Basics chapter and then drooled over about 15 recipes I wanted to make immediately. But somehow I neglected to pay much attention to the Vessels chapter at the end of the book. Vessels, as in what you put your ice cream in or on top of, not as in boats. Though, I suppose theoretically they are similar concepts. Anyway, I’d heard about these chewy dense brownies in passing over the past year and never thought to make them until I decided to make some Milk Chocolate Ice Cream where David suggests adding brownie chunks to the ice cream. Well, this could have been the best idea I’ve ever acted on because these brownies were hands down the BEST brownies I’ve ever eaten. Like, ever ever. And if you’ve been reading SLH for long enough, you know that I’ve tried a few different brownie recipes. 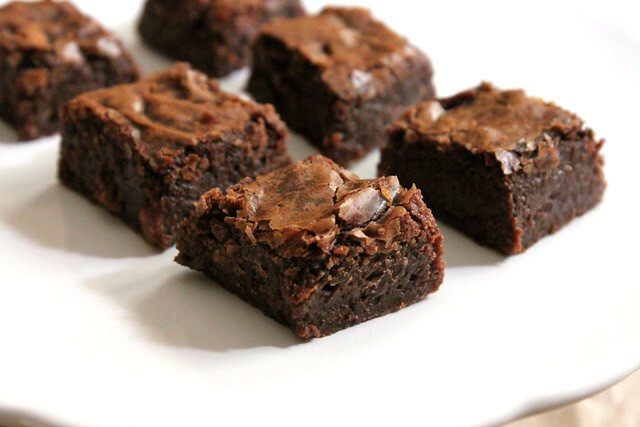 These chewy dense brownies top them all! These brownies are just as they are promised to be – chewy and dense. And utterly delicious! I added ¾ cup of Heath Bar bits to the brownie batter in place of the nuts (because, ew!) and they melted into the brownies as they baked. So, I guess you could call these Chewy Dense Toffee Brownies. Can we say pure heaven?! You can find these Heath Bar bits in just about any grocery store baking aisle these days. But if worse comes to worse and you can’t find them, smashing up a whole Heath Bar in a zip top bag with a rolling pin will work just as well. I’ve made two other recipes with these Heath Bar bits inside and they’ve both turned out amazingly! My chocolate chip toffee bars remain my #1 go-to for a quick dessert to make when company is coming over. And then THE Baked Brownie turned up in my life and I threw a handful of the Heath Bar bits into that batter in addition to some butterscotch chips. Holy cow! Caramel-y brownies are the BEST! I urge you to mix these brownies into ice cream! Just chop or crumble them into bite-sized pieces (about 1/2-square pieces work best) and fold them into the frozen ice cream as you remove it from the machine or into softened store-bought ice cream and then refreeze until ready to serve. So easy!! Preheat the oven to 350° F. Line an 8-inch square pan with a long sheet of aluminum foil that covers the bottom and reaches up the sides. If it doesn’t reach all the way up all four sides, cross another sheet of foil over it, making a large cross with edges that overhang the sides. Grease the bottom and sides of the foil with butter or nonstick spray. Melt the butter in a medium saucepan. Add the chocolate pieces and stir constantly with a whisk over very low heat until the chocolate is melted. Remove from the heat and stir in the sugar, then the eggs one at a time, and the vanilla. Stir in the flour and the salt. Beat the batter vigorously for 30 seconds, until it begins to form a smooth ball. Stir in the chocolate chips and Heath Bar bits. Scrape the batter into the prepared pan and smooth the top out. Bake for 30 minutes, until the center feels just about set. Remove from the oven and let cool completely before removing them from the pan with the foil and cut into pieces. they look perfect! and heath bar bits?? yum! even better with chocolate ice cream!! Oh wow! I totally didn’t know about that section either and I own the book. Oops! Those brownies look yummy too! These look great! I will have to try them as I am always on the hunt for the next best brownie (& chocolate chip cookie) recipe! My current favorite is the Hershey’s recipe. Heath bar in brownies? Oh mercy! I love dense brownies…. i usually bake them just until they are set, so we practically have to eat them with a fork since they are so fudgy. I’ll be trying them with the Heath next time! holy smokes. those look like absolute perfection. i love all things david lebovitz. these brownies are great! I saw your photo on TasteSpotting and had to come and get the recipe. Your photo just stopped me in my tracks. I wanted to pick up that Brownie and take a big bite! Yum! these look awesome!!! I can’t wait to make these and blog about it! Must try these brownies NOW!! How can I veganise this recipe? You could probably swap vegetable oil for the butter and use bananas or a flax egg in places of the eggs. I haven’t tried either of these swaps so I can’t attest to them but let me know how the changes turn out!